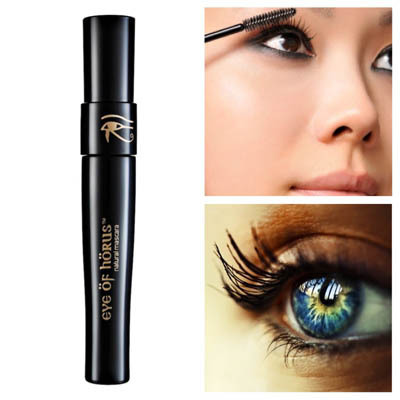 The Eye of Horus mascara gets its name from ancient Egypt, where it symbolizes protection, royal power and good health. The eye is personified in the goddess, Wadjet, whose name is derived from “wadj” which means “green.” What sets this mascara apart is that it gives a natural touch to the lashes and lengthens them, without looking too dark or too light. It doesn’t run, smudge or clump up either, making it ideal for outdoor use—say a biking day or picnic date with that special someone. Its wax-based formula allows the mascara to be easily removed with warm water—which makes it a highly-recommended product for women with sensitive eyes. Wearing mascara is one of the easiest ways to perk up a dull look, especially when in a hurry. Running late for a meeting, and you can always just curl your lashes (start from the base, curling your way up to the tip to get that Betty Boop look), apply Eye of Horus mascara, dab on some blush on the apples of your cheeks, and finish it off with your favorite lip-gloss. Eye of Horus makes it a quick and easy application, so there’s really no need to worry about your eyes looking like they have clomps of black on them. Remember that when applying mascara, it’s better to twist the cap of the brush around and around to get the formula, instead of pumping it up and down. Pumping it up and down causes air to enter the bottle, which can then cause bacteria to grow and make the product’s life-span shorter. Lastly, don’t forget to close the cap tight to prevent the air from entering and drying it up. Go for gold and look like a goddess using Eye of Horus. With naturally-looking long and thick lashes, anyone is sure to take another look at those eyes.